If you have enjoyed the Meffert’s Pyraminx then the Volcano designed by Timur Evbatyrov will be even more of a joy to twist. Not only does the Volcano have all the moves of the Pyraminx, but it also turns on its face. This adds an extra element of unexpected puzzling fun. 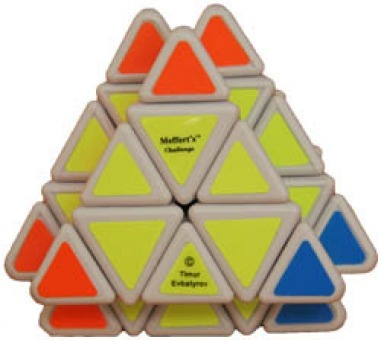 The Volcano is not just one Pyraminx, but four! The Fusing of four Pyraminx’s makes this is a truly amazing puzzle that you will not only want to own, but also to give friends to enjoy as well.